There has been a noticeable uptick in the number of food and beverage recalls in the past few years, made even more conspicuous due to how quickly information spreads online. With the additional scrutiny, it becomes increasingly important for companies to focus on risk management and response strategies. To that effect, a comprehensive understanding of recalls is crucial. What are some of the most common reasons for recalls? What are the different recall classifications? Whose responsibility is it to issue a recall? Does the FDA provide any guidance on the proper steps to take? What are the most common mistakes made during the food and drug recall process? How can they be avoided? How can companies minimize the fallout that occurs when a product is recalled? Going forward, what risk management strategies are most effective? 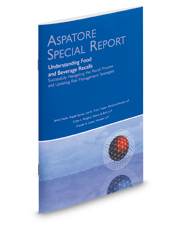 Understanding Food and Beverage Recalls provides feedback from some of the nation's leading legal minds on all aspects of the recall process, from initiation to damage control. These experts give insight into common questions and misconceptions regarding food and beverage recalls, and share their best practices for keeping up-to-date on FDA developments and overcoming challenges associated with upcoming changes. Additionally, the authors discuss recent noteworthy cases and successful defense strategies. This report offers readers an in-depth look at these issues as they continue to unfold.